Pyrogel XTE is the most effective high-temperature insulation material in the industrial market, typically 2-5 times thinner than other widely used insulation products. It is our easiest product ever to handle, store, and install. 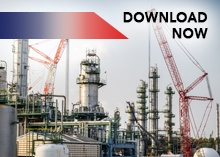 Pyrogel XTE is used for a wide range of industrial applications encompassing project and maintenance work in refineries, petrochemical, and gas processing plants. Pyrogel XTE high-temperature insulation is versatile, efficient, durable, and more productive to install. Pyrogel XTE has demonstrated time-saving advantages in turnarounds across a range of applications, with its greatest benefit seen in vessels and large bore piping. Pyrogel XTE is extremely hydrophobic and breathable. 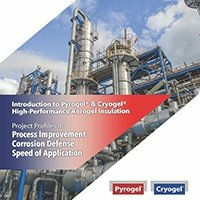 By keeping the underlying asset drier for longer, Pyrogel XTE offers world-class leading CUI (corrosion under insulation) defense. Pyrogel XTE delivers industry-leading high thermal performance in a flexible, environmentally safe, and easy-to-use industrial insulation product. * Nominal values. Thicknesses measured using a method derived from ASTM C 518 and another proprietary method to provide resolutions an order of magnitude smaller than ASTM C 167. Pyrogel insulation is easily cut and conformed to complex shapes, tight curvatures, and spaces with restricted access. 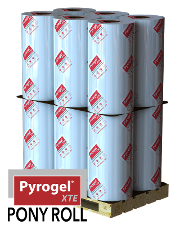 Pyrogel XTE supports more insulation coverage per man hour than traditional forms of insulation. Unlike rigid pre-forms such as pipe cover or board, the same Pyrogel® XTE blanket can be kitted to fit any shape or design. Reduce the time and effort spent managing large numbers of SKU's. 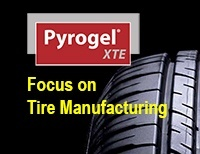 Pyrogel XTE offers unrivaled versatility. Pyrogel® XTE repels liquid water but allows vapor to escape, there by keeping pipe and equipment drier for longer. 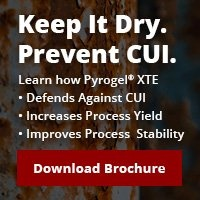 Pyrogel XTE supports unrivaled CUI defense, better process stability, and extends the life of your assets.